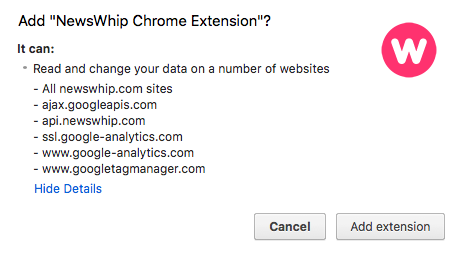 When a Chrome extension interacts with third-party services, like NewsWhip's, it must declare that it does this and ask your permission to run. This is normal. * Communicate with NewsWhip's database using our Application Programming Interface (API). * Communicate with Google Analytics. * Use Google's APIs for rendering the page smoothly.